We have about 2 weeks left in the school year, then it’s summer vacation. I haven’t decided yet if I’m excited to have my kids around more, or terrified. Probably a bit of both, if I’m honest! Luckily it’s easier to help them stay in touch with their friends with these Summer Break Keep in Touch Printables for School Kids. 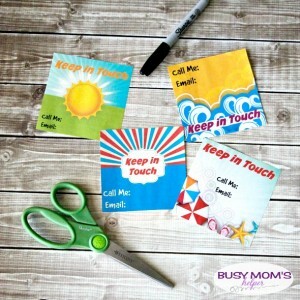 These will make it super simple to stay in touch to plan playdates and such during their time out of school. Since I don’t want them giving our phone number and email out to just random people, I’ll of course be helping them hand these to their school friends. Another option is to give blank ones to your friends so they can ask their mom/dad to fill in their info so YOU can call/email to set up a playdate. I did four different designs because, as you know, kids can be really picky as to what they do or don’t like! Or maybe they want to give a different design depending on the friend. Whichever, you can just download and print whichever ones you want – they do 4 to a page, and our roughly 4.25 inches in size if you print them on 8.5×11 paper. Not exactly, but whatever. Don’t forget to write your child’s name on there, maybe even yours (since it’s often the parents who do the contacting) so the friend knows who it is. 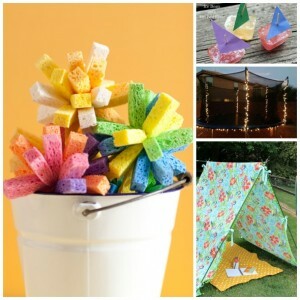 Here’s more summer time fun!